I made my first fall wreath over the weekend and it turned out better than I expected! I use the term "made" very loosely because I didn't really make anything on it. The wreath was originally $40 but I got it for $8! I couldn't have made one for that cheap! 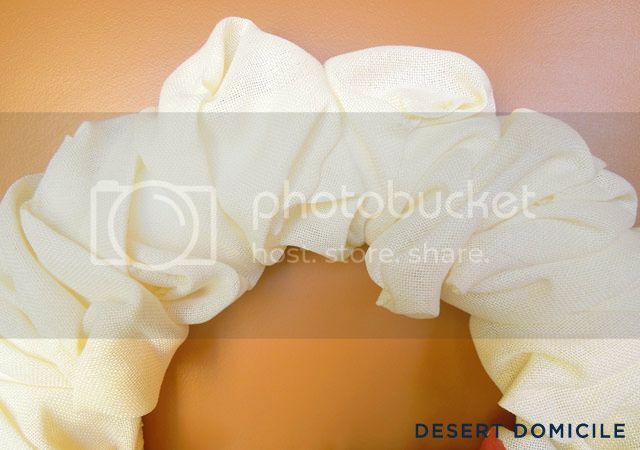 When I was checking out, the girl asked me where I was going to hang it since it's so light colored and would get dirty easily. I said outside even though the tag clearly said indoors only. I'm a rebel, what can I say haha Her comment stuck in my head so I sprayed a few coats of Scotchgard on it before I began to fallify it. I wasn't sure how to decorate it (again, first fall wreath) so I wandered around Michael's for a little while looking at all of their fall pick options. I narrowed my choices down to two that I got on clearance for $1.49 and $2.49. 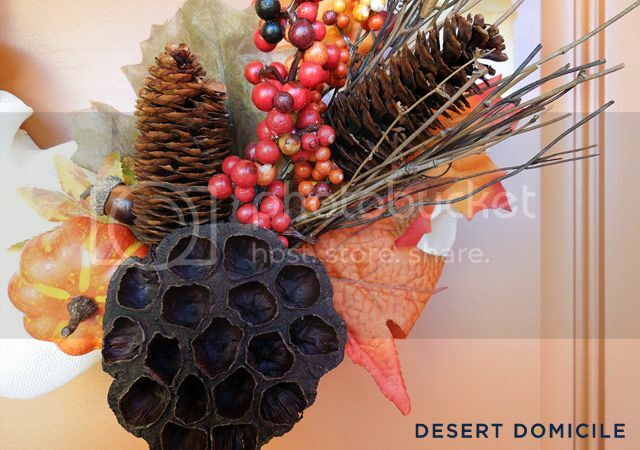 The main pick is the one you see with the dried lotus pod, pinecones, sticks, faux leaves and faux orange/yellow berries. 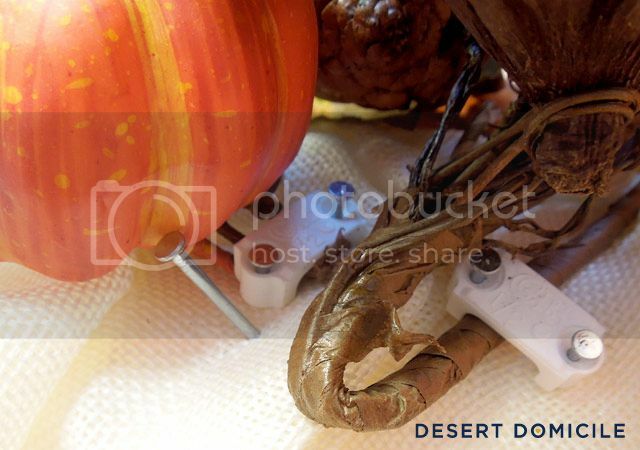 I pulled the pumpkin, the acorn, and the red berries off of the other pick and nestled them into the main pick. 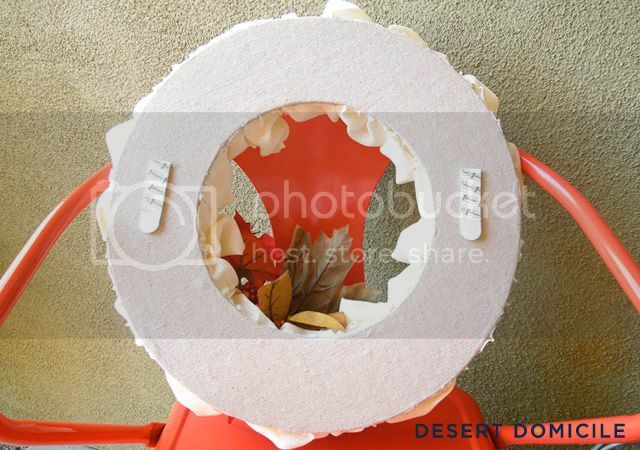 I didn't want to permanently attach anything to the burlap wreath so glue was out of the question. Instead, I used a few cable staples to hold the picks in place. 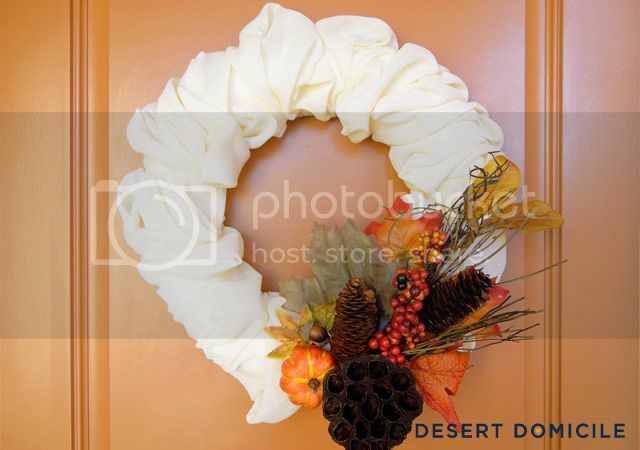 The wreath form underneath the burlap is foam so the nails slid in like butter! I didn't measure the placement, I just eyeballed where I thought the wreath would look the best and then I stuck it in place. I love the texture of the burlap and hope that the Scotchgard helps keep it from getting dirty. 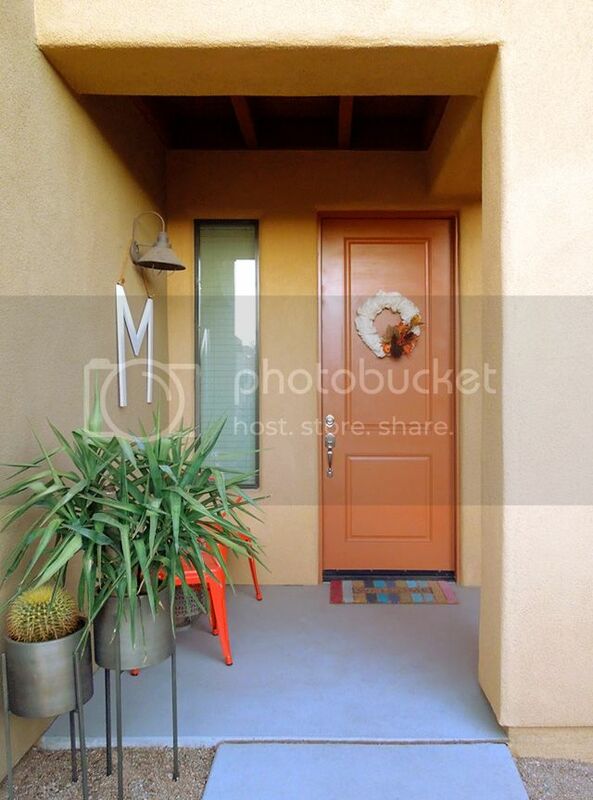 Our planters used to sit in front of our sidelight window (see below) but our spineless yucca wasn't getting enough light and it started to die so we moved the planters out into part of the yard. The planters' legs are buried in the dirt because the planters fell over during a monsoon storm. They got scratched up and the crashing noise scared us half to death so burying them seemed like a good solution for preventing a repeat crash performance. What do you think of my first fall wreath? It looks great and the scotch guard is a great tip. Thanks Julia! I'll let you know if it helped any after I take the wreath down. $8!!! That's a number I like to see. It looks great! Looks great, especially against the color of your door. Thanks Gabbi! 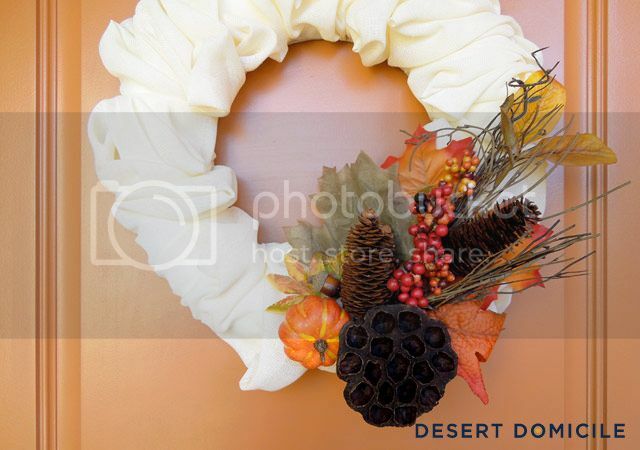 Hopefully the tips I used will allow me to reuse the wreath form for other holidays! Your wreath turned out so well. 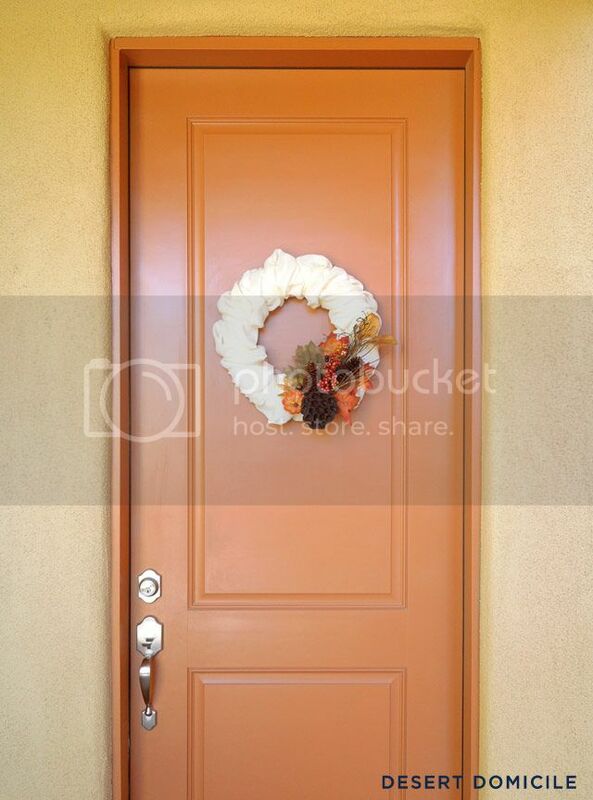 I think the colour of your door suits a fall wreath perfectly. Lovely! Good thinking on the scotch guard. 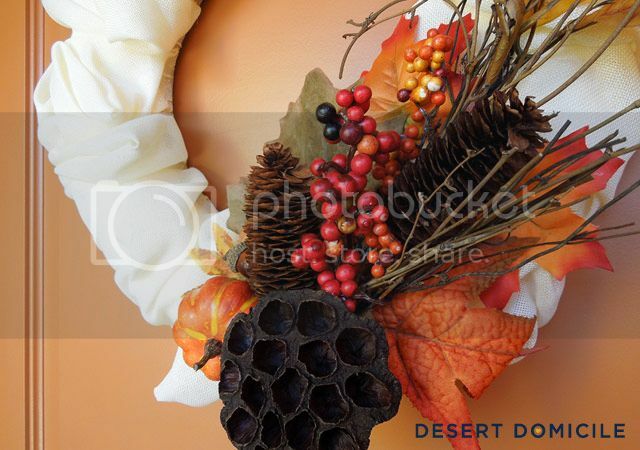 The wreath turned out very fall and beautiful! Looks great! 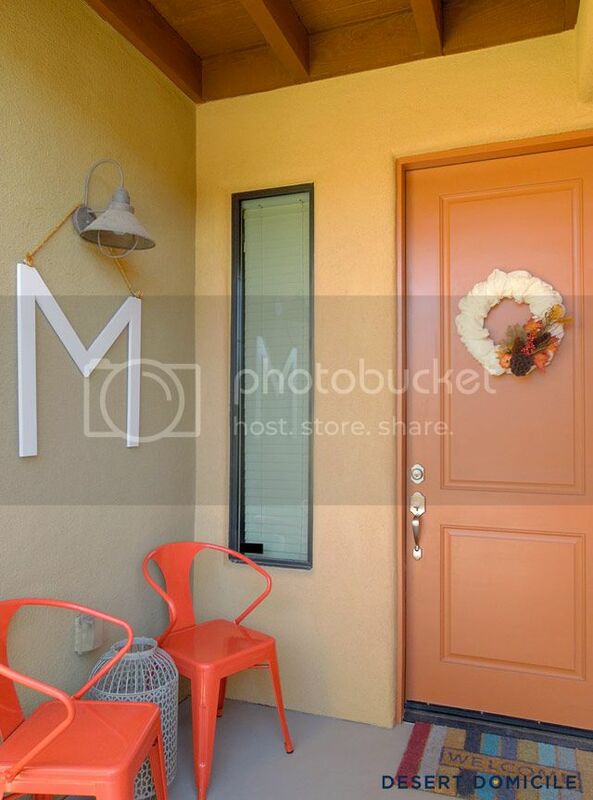 The white looks gorgeous against your orange door! 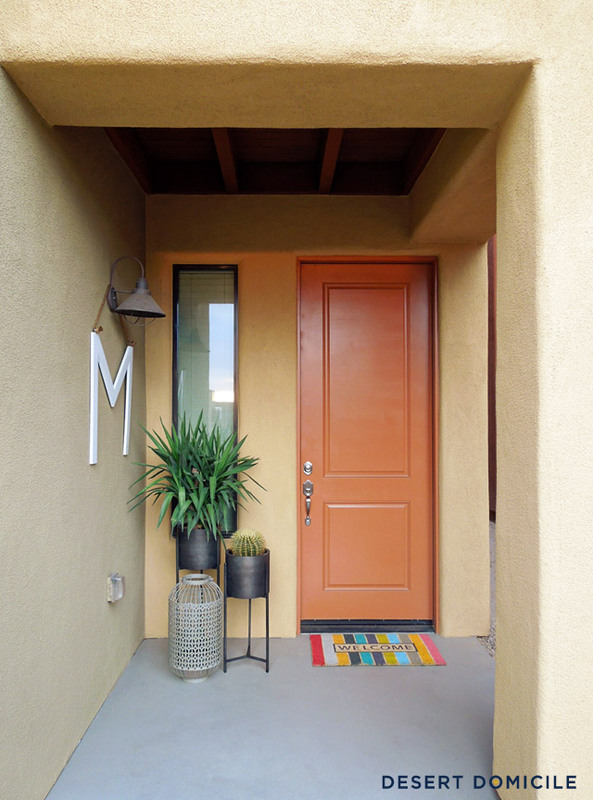 Love your porch area. Your wreath is so cute. I love it against your orange door. This looks great! Love the fallification. And I love love love those pots for your plants. Too unique and cool. 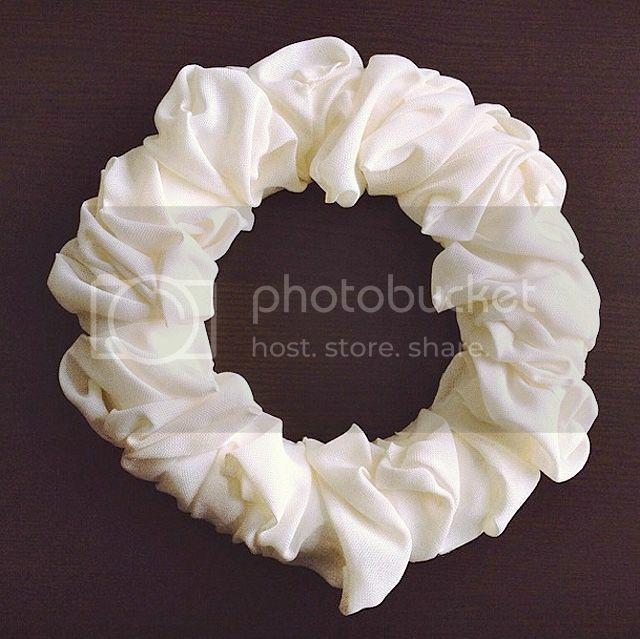 What a gorgeous wreath! I just came across tons of burlap at a garage sale the other day and have been wondering what to do with it. Thank you for the inspiration!